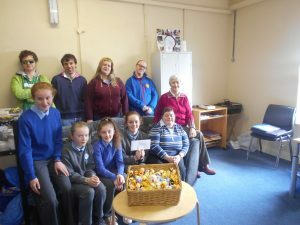 As part of their preparation for Confirmation the 6th class pupils organised a Bun Sale in the school. Every child got to buy at least one bun. The proceeds from this bun sale went to the Moate branch of St. Hilda’s. They raised over €300 for this cause and a cheque was presented to St. Hilda’s in Tuar Ard.